BRCA1 and BRCA2 play a big role in preventing cancer. They belong to a class of genes called tumor suppressors, which ensure that breast, ovarian, and other types of cells don’t grow or divide too rapidly or uncontrollably. If one copy of these genes is broken (has a mutation), it does not function correctly and can increase someone’s risk of developing a cancer. BRCA1 and BRCA2 mutations are inherited, meaning that if your mother or the father has a BRCA gene mutation, you have a 50 percent chance of having the mutation. However, harmful BRCA mutations are uncommon in the general population. About one in every 500 women in the United States has either a BRCA1 or BRCA2 gene mutation. Do All BRCA Mutations Come with the Same Cancer Risk? Still, a BRCA mutation does increase risk or predisposition for certain types of cancer. In the general population, twelve out of 100 women will develop breast cancer and one to two out of 100 women will develop ovarian cancer in their lifetime. About 50 out of 100 women who have a BRCA1 or BRCA2 mutation will develop breast cancer and 30 out of 100 of these women will develop ovarian cancer by age 70. Overall, about five to 10 percent of breast cancer diagnoses and about 15 percent of ovarian cancer diagnoses are related to a BRCA mutation. There is a higher prevalence of harmful BRCA1 and BRCA2 mutations in individuals of Ashkenazi Jewish descent than people in the general population. Individuals in this group, whose DNA can be traced to Eastern and Central Europe, are about ten times more likely to have a BRCA mutation. In fact, one in every forty women of this descent will have a BRCA mutation. Genetic testing enables experts to look for alterations in your genes by analyzing a your blood sample. Testing should be performed only when your individual or family history suggests the presence of a mutation. 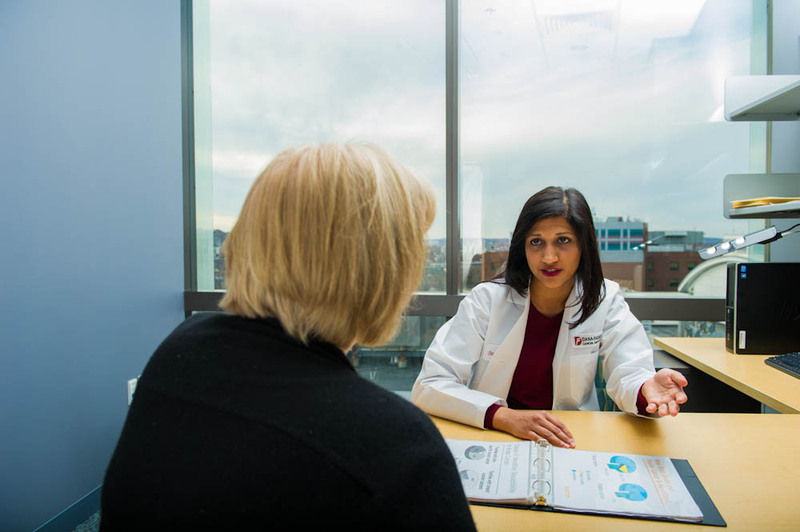 To undergo genetic testing, you can find a genetic counselor, such as those at Dana-Farber’s Center for Cancer Genetics and Prevention, to explain your personal and family history and discuss the risks and benefits of proceeding with testing. Learn more about genetic testing at Dana-Farber Cancer Institute.